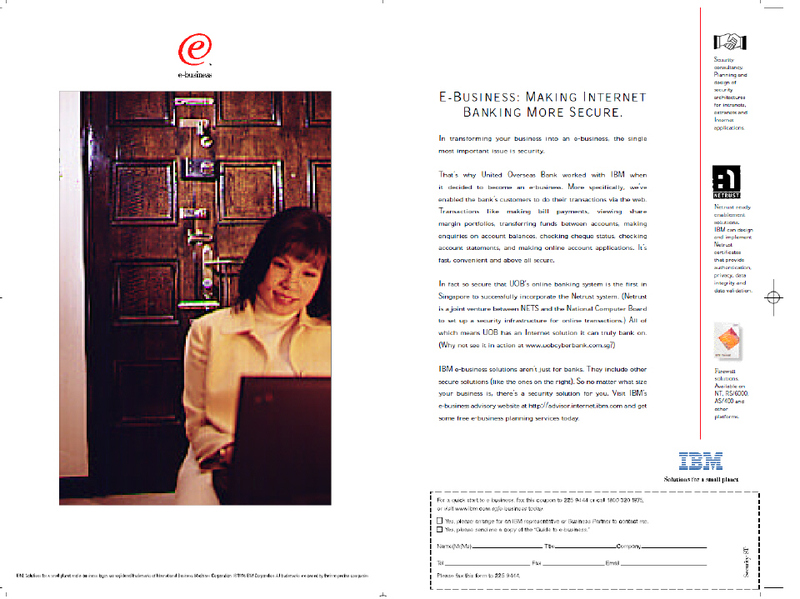 These print ads ran in Singapore, extolling the virtues of IBM’s strengths in security and availability. Koon Seng Construction Pte Ltd wanted a networked solution tailored specifically to its industry at an affordable price. That’s why the manager called IBM First Connect. After an initial consultancy to establish what was needed, the solution – a construction and cost management suite running on PC servers connected into an intranet by routers and ISDN links – was up and running within weeks, reducing communication lagtime. 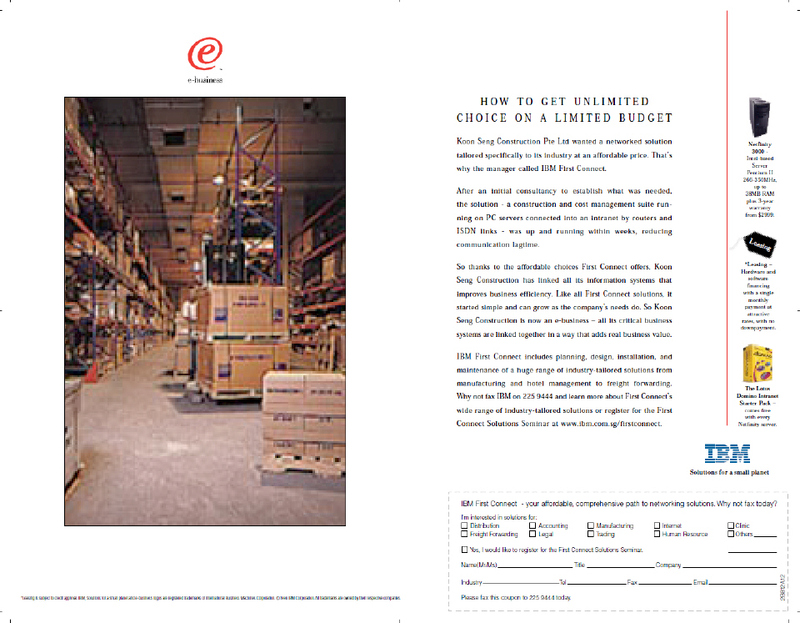 So thanks to the affordable choices First Connect offers, Koon Seng Construction has linked all its information systems that improves business efficiency. Like all First Connect solutions, it started simple and can grow as the company’s needs do. So Koon Seng Construction is now an e-business – all its critical business systems are linked together in a way that adds real business value. IBM First Connect includes planning, design, installation, and maintenance of a huge range of industry-tailored solutions from manufacturing and hotel management to freight forwarding. Why not fax IBM on 225 9444 and learn more about First Connect’s wide range of industry-tailored solutions or register for the First Connect Solutions Seminar at http://www.ibm.com.sg/firstconnect? In transforming your business into an e-business, the single most important issue is security. That’s why United Overseas Bank worked with IBM when it decided to become an e-business. More specifically, we’ve enabled the bank’s customers to do their transactions via the web. Transactions like making bill payments, viewing share margin portfolios, transferring funds between accounts, making enquiries on account balances, checking cheque status, checking account statements, and making online account applications. It’s fast, convenient and above all secure. In fact so secure that UOB’s online banking system is the first in Singapore to successfully incorporate the Netrust system. (Netrust is a joint venture between NETS and the National Computer Board to set up a security infrastructure for online transactions.) All of which means UOB has an Internet solution it can truly bank on. IBM e-business solutions aren’t just for banks. They include other secure solutions (like the ones on the right). So no matter what size your business is, there’s a security solution for you. Visit IBM’s e-business advisory website at http://advisor.internet.ibm.com and get some free e-business planning services today.